Target $11,400 in revenue = 100% achieved which means that financial targets are on track and fundraising is starting to ensure sustainability beyond the grant period – yay! It’s important to know that $1,192 in funds have been raised for the schools. Most of which the School Champions have earmarked for their Student Nutrition Programs. 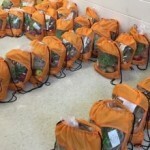 Over 200 students impacted between F2S workshops and various “food days”. This program is doing fantastically with more and more families enjoying fresh food and learning new recipes. This past months newsletter for food club members included a pizza recipe by our own Jacalyn Dryland – registered dietician. Many of the kids involved are joining in the kitchen fun. Yum!